Our elder son Isaac is fast approaching his fourth birthday but from an early age he has always been an inquisitive boy at heart, curious about the world and wanting to know how things work – particularly if it relates to gadgets. For instance, he learned how to unlock and operate my iPod just a couple of weeks after learning to walk. He has been taking pictures with a camera since early this summer. And he regularly gives his Grandpa computer lessons as he shows him round his latest discoveries on the CBeebies website. Which is why I have taken him to Intech (now the Winchester Science Centre), a hands-on interactive science and technology centre a couple of times over the past few months. I suspected our little engineer would enjoy it. In fact, he loved it. It really is rocket science, Dad! I shouldn’t have been surprised. After all, he does have two scientists for parents: one (Heather) who earned a doctorate, the other (me, obviously) who barely scraped through his degree but has compensated with an expensive gadget habit. For a child who has developed similar interests, Intech has been a fantastic resource for Zac to visit – like having your own science fair just down the road. Although he is too young to really appreciate the science behind many of the exhibits, he quickly embraced their hands-on nature. From the moment we set foot inside, it was like watching a kid in a candy shop – or, at the very least, a geek at a tech fair. On our first visit, he immediately set about building electric circuits before haring around, operating a crane, scanning items in a mock-up shop to learn about recycling and doing all manner of other stuff. Yes, at his age it is more about ‘play’ than it is actual learning, but I found it fascinating to observe the way he intuitively grasped concepts and even take some of it in. So, for instance, on his first visit we experimented with different types of battery and a voltmeter, and he immediately latched on to the idea that some types of battery are more powerful than others, and why his ‘bigger’ toys require more and bigger batteries to operate. When we returned for our second visit three months later, we went back to the same exhibit and – completely unprompted and without needing to be reminded – he started lecturing me about the difference between bigger and smaller batteries. That second visit was even better because they were holding an event where lots of volunteers from local schools and universities put on additional exhibits to entertain and educate. These ranged from programming a robot to building and launching a bottle rocket, a task Zac set upon with an enthusiasm normally only reserved for my iPad or the latest Katy Perry single. 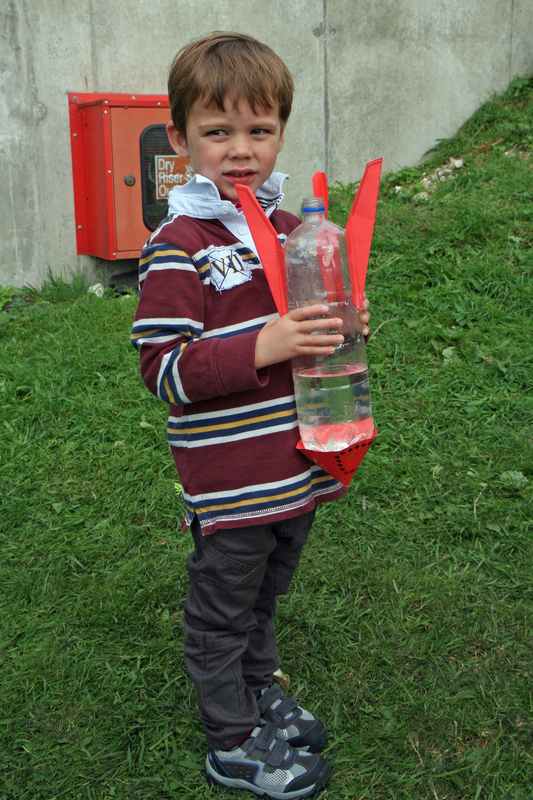 At the time, I carefully explained to him that pumping air into the rocket creates a build-up of pressure which is eventually enough to launch it skywards. I didn’t think anything of it until the following weekend when I asked him to explain photos from the day to his grandparents, and he launched into a near word-perfect description of the principles behind basic rocketry. Will Zac turn out like this one day? The learning capacity of any inquisitive young child never ceases to fill me with wonder. Make that doubly so when it’s one of your own children. With every visit, he may only take one or two big things on board – that in itself is amazing enough to me – but it’s clear that the fun he has only supports rather than hinders his learning. He may never become a scientist – given his performing tendencies, I still suspect his ultimate path may include a failed X Factor audition – but he will certainly enjoy himself at places like this for as long as he shows an interest in them. If he’s having fun while also learning, you can’t really ask for much more than that. 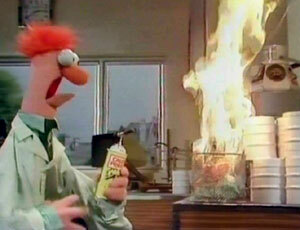 Publicly, I hope he doesn’t end up like Beaker from The Muppet Show. Secretly, I don’t mind if he does. There are worse things he could grow up to be than a science geek. Intech is located just off the M3 and A34 near Winchester. Find out more at their website here. Posted in A dad's life, Days out and tagged fatherhood, Intech, parenthood, Parenting, science. Bookmark the permalink. Do you get the TV program Myth Busters in the UK? Here it’s on the Discovery Channel. These guys are physicists, and they’re having fun proving or disproving various myths. They blow a lot of stuff up. One of the things they did that I’m aware of was investigate the old saying “sank like a lead balloon”. They made a balloon with a lead skin and filled it with helium, and it floated. I’m thinking Zac would love it. By six I think they’ve pretty much worked out how to take it apart and put it back together again. And then fixed it so they can lock you out – the real meaning of ‘parental controls’, I suspect. I’ve heard of Myth Busters, although I’ve never watched it. Sounds like the perfect thing for Zac, who has shown an interest in science-based programmes pitched at a pre-school/pre-teen audience. Love the idea of the Challenger Learning Centre! It’s great to have an interactive resource like this so close to us. (We’re about 35 minutes’ drive away.) Keep up the good work! Tim, the Challenger Learning Center was named, of course, for the tragic space shuttle Challenger disaster. It’s hard to believe that happened 25 years ago, almost 26. The CLC also has an IMAX theater and a really cool digital planetarium. Several months back, they hosted a viewing of the new Orion spacecraft which will replace the shuttles. So of course I had to see it–I got claustrophobic just looking at it 🙂 And guess what? I found out they do have them in the UK–according to this link, there are 47 CLC’s in the U.S., Canada, the UK, and S.Korea. You should find one for Zac! The one in the UK is in Leicester–don’t know if that’s anywhere near you. Leciester is a couple of hours’ drive away from us, so if we’re ever passing by that way I’ll bear it in mind. Thanks! What, that little thing? Pah! That sounds fantastic, it’s great to have this resource nearby so he can go and play and learn. It is amazing what kids can pick up if they have a real interest in something. It’s a great place. The emphasis is on interactivity and fun, so it works as a learning resource for both older kids and for younger ones like Isaac, who at the time wasn’t quite four yet. When I took him back a second and a third time he amazed me with how much he had remembered. I think the most important thing I learned from taking Isaac there is that there’s no need to worry about things being a little too old for him. If he’s interested enough, he will find a way to bridge the gap – with a little helping hand when he needs it. But by and large he grasped things with the speed and flexibility that only a child’s mind can work with. This sounds great, well done Isaac! We are near @Bristol but I haven’t been for ages, I really must take the kids there again soon, you have inspired me! It’s definitely worth it, and all the better on a busy day when the place is abuzz with the sound of kids having fun. Going on a day when they have some kind of organised event is good too. Even with Isaac’s short attention span, it was easily good for a busy half-day. It’s astonishing how quickly they learn when something really captures their interest. InTech sounds like how I would like school to be: just a massive playground with things to discover and helpful adults on hand to answer the tricky questions (or sneakily look them up on Google). Lovely that Zac shares your interests! It’s a great place and I wish I’d had access to something like that when I was younger. I love the way these places encourage kids to be hands-on, rather than discouraging them by putting everything in glass cabinets in a look-don’t-touch way. What a fantastic day out. We must take our girls to the one near Manchester. They’re great facilities. We’re lucky to have one within reasonable driving distance, and we keep going back at least once a year now. It probably would be the sort of place he’d enjoy. It’s all very practical with an emphasis on learning through fun and experience as much as anything. It’s even better since its refurb. Smart boy! I think our kids’ generation all get to grips with the technology given the opportunity. In moderation, that can only be a good thing. It’s an interesting place to go, and of course grown-ups can play with the exhibits too! It’s great to see the sense of wonder on Isaac’s face whenever he gets to grips with something new.